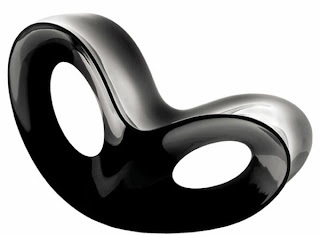 Ron Arad, a brilliant industrial designer, can do no wrong. This rocker is simply.... rocking. I love the shape of the chair. Who knew when you conjoin two ovals together, it becomes a sleek clean line chair? He's one of the most inventive guys out there. I can't wait to see what he comes up with next. In the mean time, get cracking on ordering these chairs. They come in glossy black, glossy white, orange, light gray, and white. The glossy finishes are not suitable for outdoors. You can purchase them at Unica Home. The best part is the price.... they are under a thousand each but they look like a million bucks.